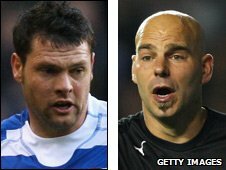 Reading have confirmed club captain Graeme Murty, goalkeeper Marcus Hahnemann, defender Michael Duberry and striker Leroy Lita are being released. Alan Bennett and young professionals Gary Frewen, Scott Golbourne, Tom Hateley and Daniel Spence will also be leaving the Madejski Stadium. Midfielder Brynjar Gunnarsson has been offered a new one-year contract. Director of football Nick Hammond said it was the end of an era following Steve Coppell's resignation as manager. "The players who are leaving will all be sorely missed, but this week has seen the end of an era and it's time for the club to move on," Hammond told the club's website. The Royals have also offered new deals to youngsters Oliver Bozanic, Scott Davies and Ben Hamer. Murty, 34, was the Royals' longest-serving player and is currently in his testimonial year. He joined in a £700,000 deal from York in 1998 and made 339 appearances for the club, helping Reading win promotions from League One and eventually into the Premier League. But he struggled to force his way into Coppell's plans this season, making only one appearance in the FA Cup defeat at Cardiff, and had a spell on loan at Charlton. He told BBC Berkshire: "I'm disappointed because I didn't want my career at Reading to end this way, I would have preferred to go out on a high having played 46 games and lead us back into the Premier League. "As it was it didn't happen that way. I've had a fantastic time and I've had some great support. "I'm gutted to be leaving the club but I think I'm leaving it in a healthier state than when I joined." United States international Hahnemann, 36, initially joined Reading on a month's loan from Fulham in December 2001, making the move permanent the following summer. In total he made 303 appearances for the club and said: "I knew it was coming. When they didn't offer me a deal months ago you know it's going to happen. "It's still hard to take because everyone knows how much I love the club and the fans have been so good to be over the years. "I'm not finished in England yet and I want to continue playing over here." Duberry joined from Stoke in January 2007 and made 54 appearances in two-and-a half years with the club. The release of Lita is the least surprising of the four after he fell out of favour and spent three months of this season on loan at Norwich. He arrived at the Madejski Stadium in 2005 and scored 11 league goals in his first season as Reading won the Championship title. Lita made 12 appearances for the Royals this season, scoring just one goal.